Marcus Law felt Kettering Town endured a “frustrating day” after they were held to a 1-1 draw by St Neots Town at Latimer Park. 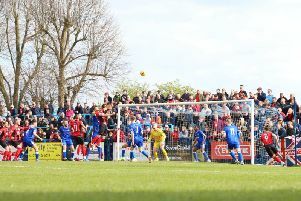 The Poppies fell behind early in the second half with former Kettering man Drew Roberts giving the visitors the lead. But Kettering were level within a minute thanks to a fine volley from Will Grocott. However, the Poppies were unable to find another goal in their bid for a fifth win in a row. The stalemate has left Law’s team seven points off the top five, although they still have games in hand on most of the clubs above them. But the Kettering boss was left to reflect on a day when “it just didn’t happen”. “It was a frustrating day against a team who came for a draw,” Law said. “We are disappointed because they have scored from a goal that looked offside and that was only way they were going to get one. “It says something about where we are if teams are coming to our ground and thinking that a point will be a fantastic result for them. “But it means we have to think more carefully about how we are going to break these teams down. “A bit of quality from Will got us back into it but it just didn’t happen for us after that. The Poppies’ run of home fixtures continues this week when they take on Stratford Town at Latimer Park on Tuesday night before Slough Town and Bedworth United are the visitors over the Easter weekend.